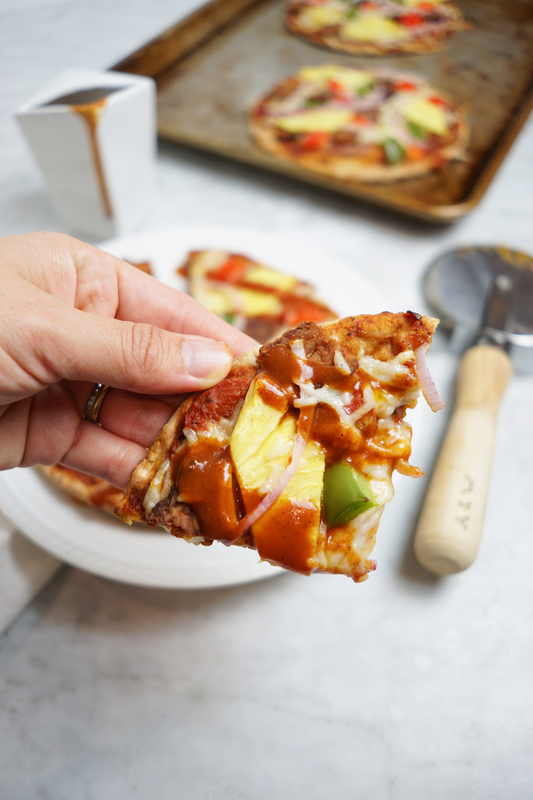 This vegan Hawaiian pizza has all the flavor of a standard meat-heavy pie, made with simple nourishing ingredients. Inspired by Blaze Pizza’s classic Hawaiian, these tasty single-serving pita pizzas are made with tempeh bacon, Daiya shredded mozzarella, pineapple, green and red bell peppers, onions, and tangy BBQ sauce. I asked you guys on Instagram recently if you are pro or anti pineapple pizza and, as expected, the group was divided right down the middle. Apparently, pineapple is a very polarizing pizza topping! I’m pro-pineapple all the way. I love the sweet and savory combo of fresh fruit with Italian spices and tangy tomato sauce. These Vegan Hawaiian Pizzas are so good that I think they could convert even the most fervent pineapple critic. 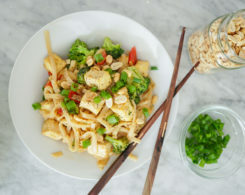 With a smokey, savory aroma from the tempeh bacon and the crisp crunch of red onion and green and red bell pepper, the pineapple and BBQ sauce add a burst of welcomed sweetness to the mix. 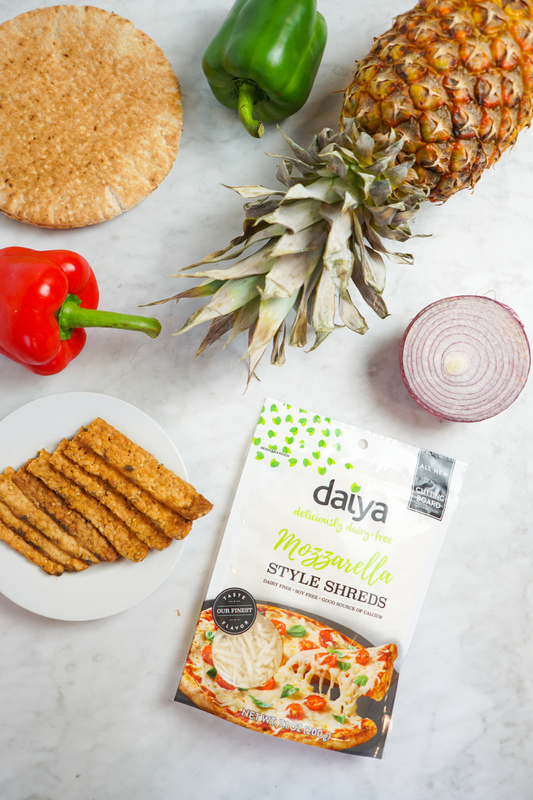 These pita pizzas are topped with ooey gooey vegan mozzarella cheese from Daiya’s new Cutting Board Collection, which melts so perfectly, you’ll have a hard time detecting that it’s dairy-free. The inspiration for this recipe came from a delicious pie I had at Blaze Pizza in Pasadena recently. If you’re not familiar with Blaze, they make incredibly tasty pizza, from-scratch, in about five minutes flat in their blazing hot brick oven. 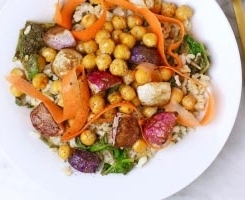 They use super simple ingredients like wheat flour and extra virgin olive oil, and all of their products are free of artificial colors, dyes, and preservatives. They recently started carrying Daiya Cutting Board Collection Shreds in 237 locations nationwide — at no additional charge for the premium plant-based topping. We have a location nearby which we’ll be frequently more often now that I know about this option. 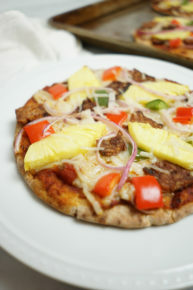 When we don’t go out though, these homemade Hawaiian pita pizzas are a great quick and easy night-in meal. They take about 15 minutes to make and are packed with nutrition. Hearty whole grains from the pita, nutrient dense plant-protein from the tempeh, and a smattering of fresh fruit and veg mean that these pies are a perfectly balanced meal. You can marinate your own tempeh to create the “bacon” flavor or buy a pre-made brand. Same with the BBQ sauce — if you’re ambitious, you can totally make your own. Or you can save time with a low-sugar, organic, store-bought version like I did. Any way you go, you’re guaranteed to get a mouthful of pizza approval from your fellow diners. I certainly did when the hubs announced that these were the best pita pizzas I’ve ever made! 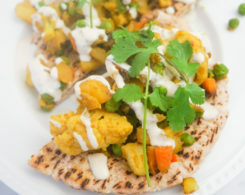 These vegan Hawaiian pita pizzas are quick, easy, delicious, and nutritious. Made with pineapple, tempeh bacon, and fresh fruit and vegetables, and drizzled with a little BBQ sauce, they're a real crowd pleaser! 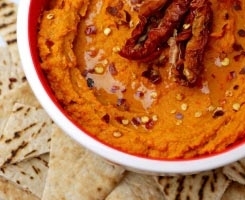 Place pitas on a greased baking sheet or pizza stone. 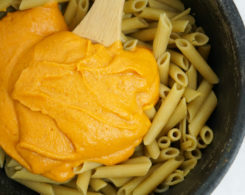 Spread with about 2 tablespoons of marinara each. Divide remaining toppings between pizzas. 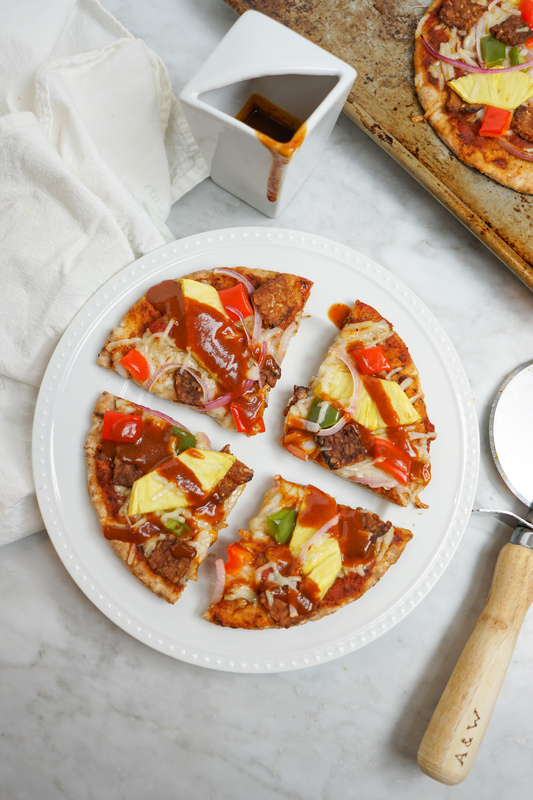 Drizzle pizzas with ½ tablespoon BBQ sauce each. *To make your own tempeh bacon, slice tempeh into strips, as thinly as possible. Marinate for at least 20 minutes with equal parts soy sauce, maple syrup, and olive oil or coconut aminos and olive oil. Option to add spices like cumin, smoked paprika, salt, and pepper. My Sauteed Apple + Arugula Pizzas are another creation that juxtaposes seemingly conflicting flavors. Give them a try next! Weigh in: What are your favorite pita pizza toppings? Are you pro or anti pineapple pizza? *This post is sponsored by Daiya but all opinions are my owns. 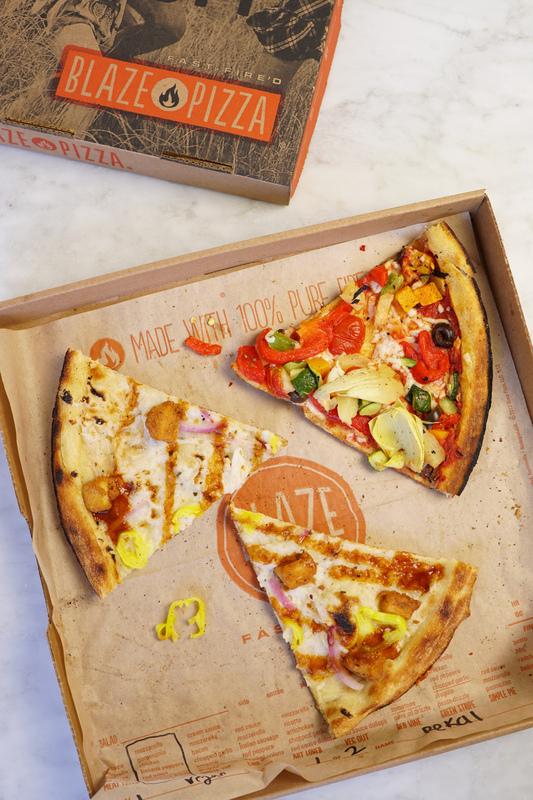 To find your nearest Blaze Pizza, click here. OMG this looks SOO good. Hawaiian is my favorite but I love that this is a vegan friendly version! I go back and forth on pineapple on pizza. Some days I love it and others I think I’ll pass. This looks sooooooo good though so not passing up on this! I’ve never had the chance to go to a Blaze pizza, but do enjoy Daiya pizza sometimes! And ham and pineapple was my favorite pizza flavor! What a fun idea for pizza night! Love this vegan option! 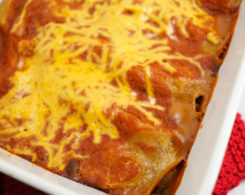 It looks great .. I’l try this recipe. Thanks for sharing! I’m pro-pineapple all the way too, it’s my fave on pizza. This sounds so good! I think it’ll be a pizza friday this week! This sounds amazing! I love Hawaiian Pizza, and really love that your version is Vegan! Yum! Yum! I am “pro pineapple pizza” too, and this looks like an incredible combination of ingredients. I’d love to try making this on a gluten free crust, The new Daiya cheese sounds good too! It’s really amazing – give it a try! Definitely a “no” pineapple on my pizza kind of gal, but I would definitely make this with the pineapple on the side! Those cutting board shreds are good!! My hubby loves Hawaiian pizza, but me–no thanks! The rest of it looks great though. Love Daiya cheese! My husband is the one who got me hooked on it! It’s the best! Thanks, Jillian!